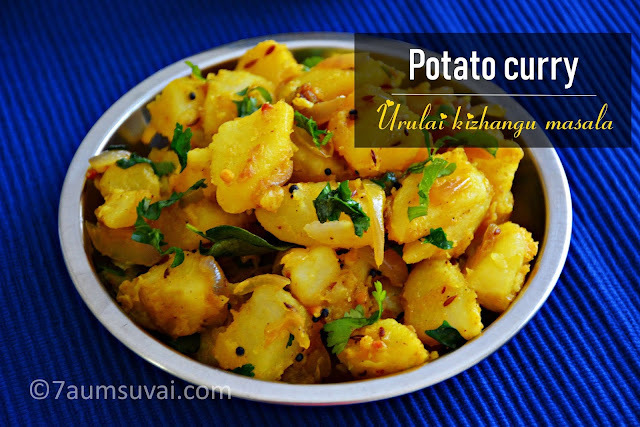 Potato curry or potato masala, prepared with boiled and chopped potatoes along with other spices, which goes very well with hot rice and sambar. It is a beginners recipe, less ingredients but tastes yummy. Pressure cook the potatoes for 1 to 2 whistles or until soft. Cool down completely, remove skin and chop them into chunks. Set it aside. Heat oil in a pan, season with items given in the list for seasoning. Add chopped onions, saute until they become soft. Followed by turmeric powder, red chilli powder, and garam masala powder, give a quick mix and add the boiled potatoes along with enough salt, mix well thoroughly. Cover with a lid and continue to cook for 5 to 10 mins or until well cooked. Finally garnish with chopped coriander leaves and serve hot with rice and sambar. You may either chop the potatoes or mash them after cooking (not completely mashing it) to make this recipe. Also you can replace red chilli powder with sambar powder or kuzhambu milagai thool (which has garam masala in it).